I was in Emily Smith’s Advance Reading Session at the July Reading Institute!! She did a shared reading of one part of the book and asked us to tell our group which are the POP OUT SENTENCE or MAIN IDEA SENTENCE and which seems more DETAIL SENTENCES. 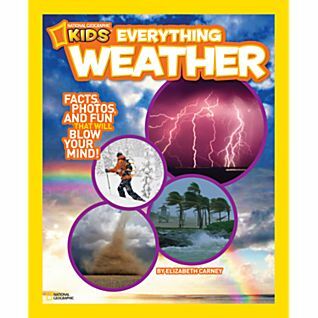 As she read, she got us to think about what weather is and if all our book club books are related to weather (the other club topics were tornado, hurricane, and volcanoes). Soon our club figured out together that weather only happens in the air so earthquakes are NOT weather. Then Emily sent us off to do this kind of work in our book. 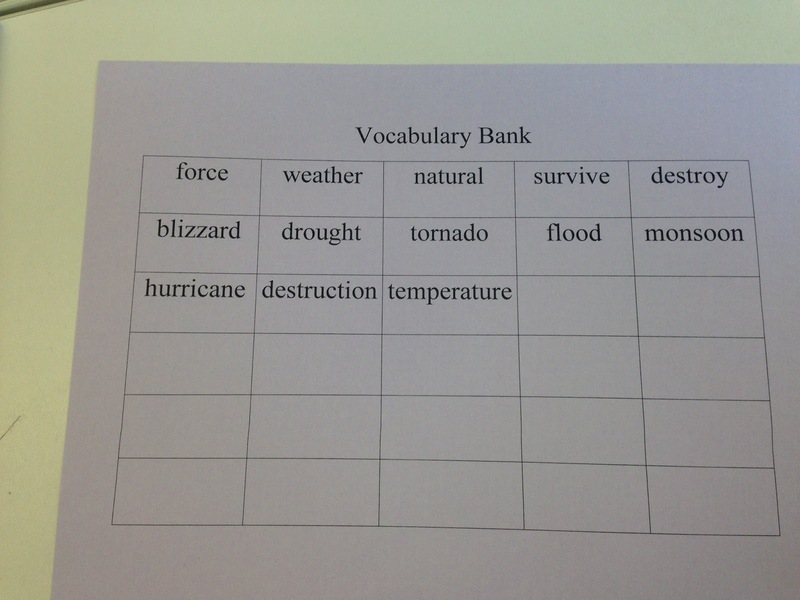 What vocabulary words need to be in a bank to help us talk about our book in our club? What are the Main Idea Sentences and the Detail Sentences? What text structure is being used to organize the information? What parts might a sketch help the reader to hold onto the information to then teach it to their club? * Think about the skill you want to model (visualize, synthesis, main idea/detail)? * What tool might help (vocab word bank / a map / a timeline / a ranking system)? * What is the teaching point and how will you teach (think-aloud, prompt for turn and talks or stop and jots)? * When will you have kids have a conversation (w/partner, club or whole group)? 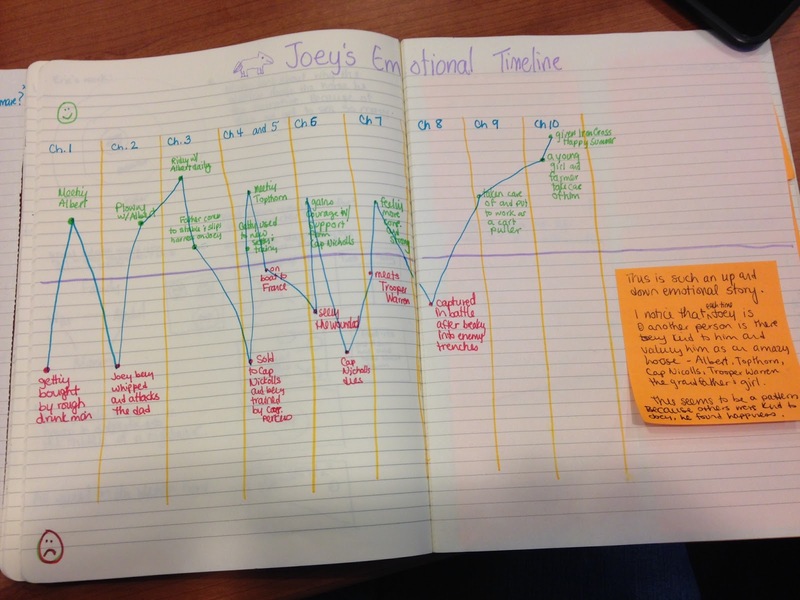 To get a felt sense of the progression, she prompted me to write a summary. 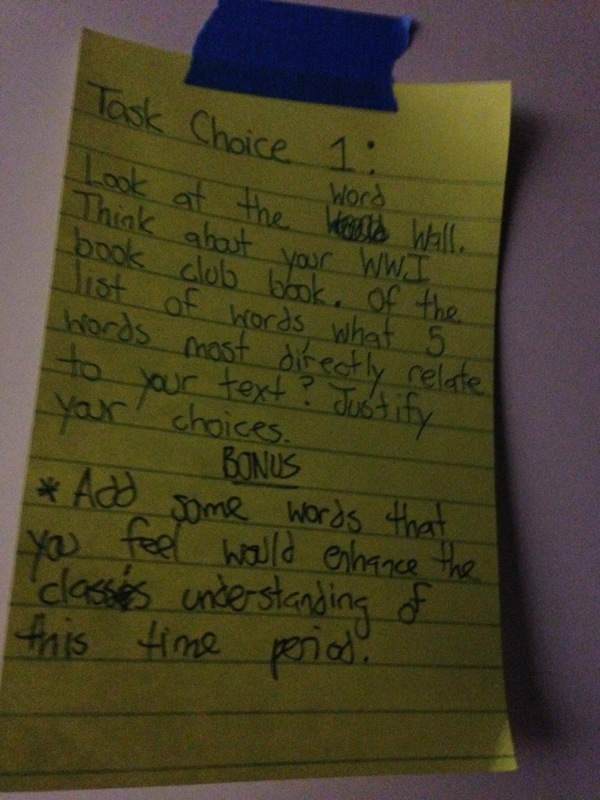 and my club discussed if it was a 2nd, 3rd, 4th, 5th or 6th grade summary. We decided mine was a 3rd grade summary because it has a main idea with details but does not use the structure of the piece to grasp the info (4th grade work). 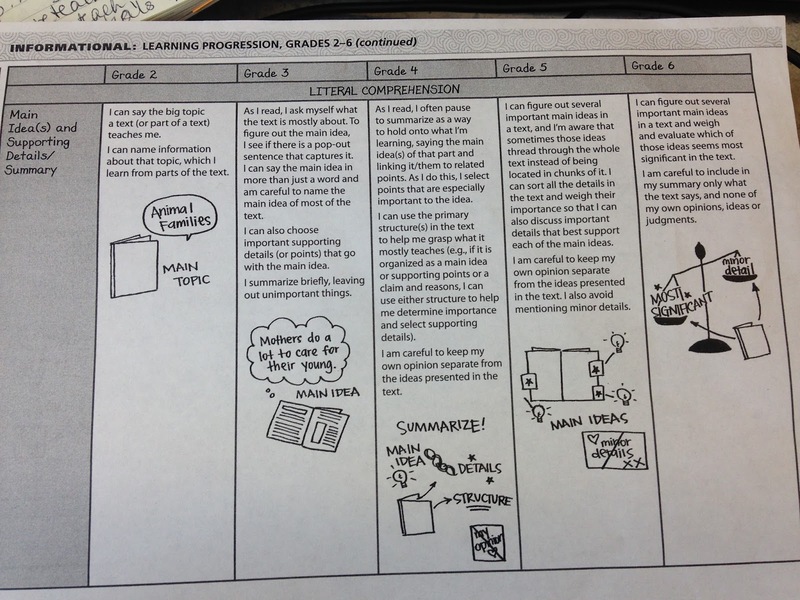 Emily pointed out that writing about reading can be annotated using the characteristics stated in the progressions. Time can be spent to revise our written comprehension to lift the level of our reading skills. Synthesis – to create something new, new understanding, from the parts. Ask – How do these parts fit together? Emily suggested that we read with a different lens and then discuss our thinking with our book club. I loved having a lens to read with. It kept me actively reading. And when we shared in book club, I had stuff to say and stuff to show. 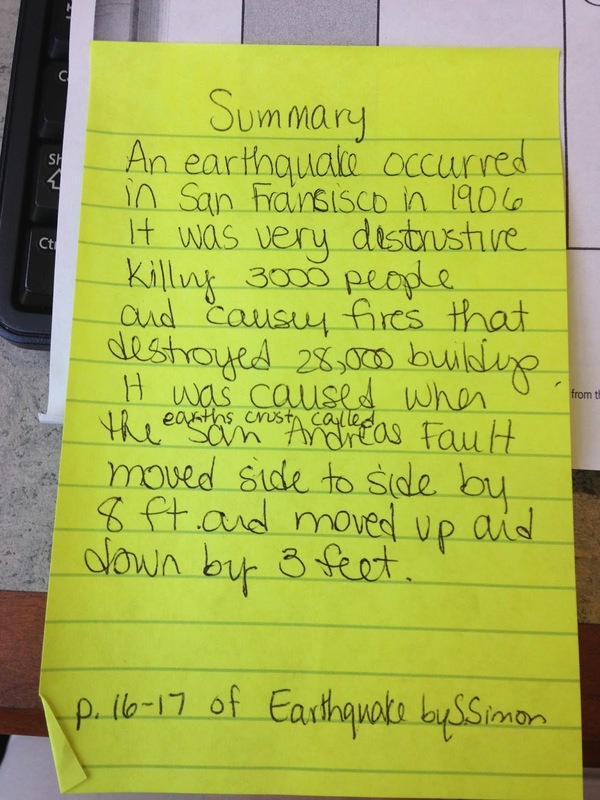 As a group member shared her findings about the history of measuring earthquakes, I could match that info to my info. 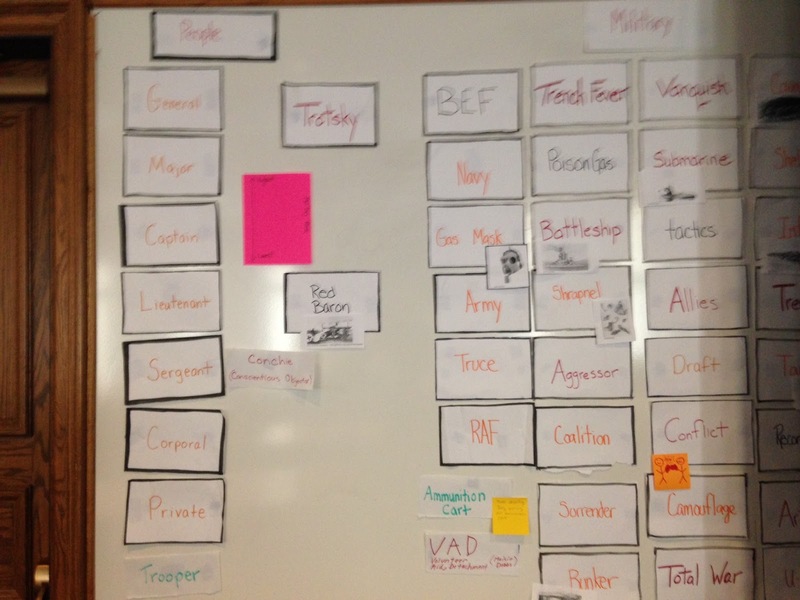 We discussed info that overlapped and new info found by each. We were very engaged and motivated to keep reading to share with our club! 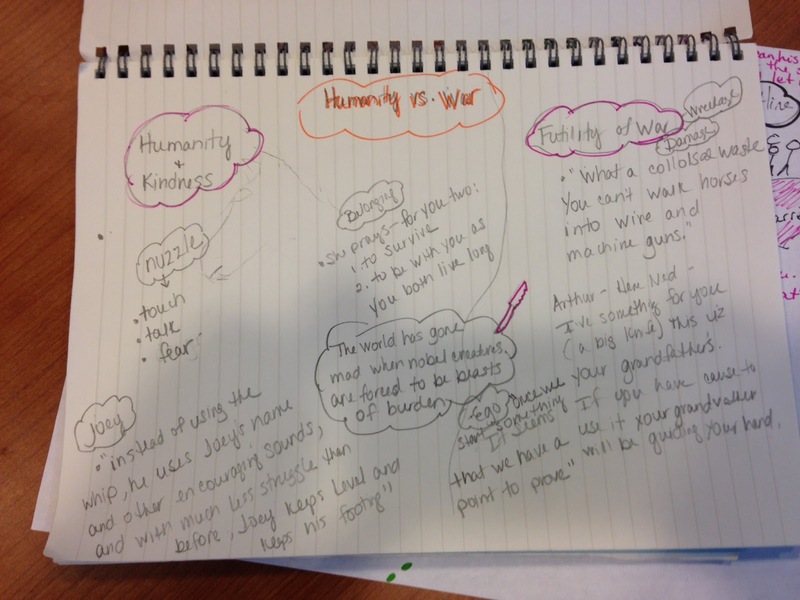 Compare and Contracts – Emily pointed out that as humans, we are wired to naturally compare/contract. We are always looking for patterns to recognize. We can remind our students that this is a life skill and not just a reading skill. We categorize always. Ever since she said this, I see myself doing this. As I write, I use metaphor, a way to compare! 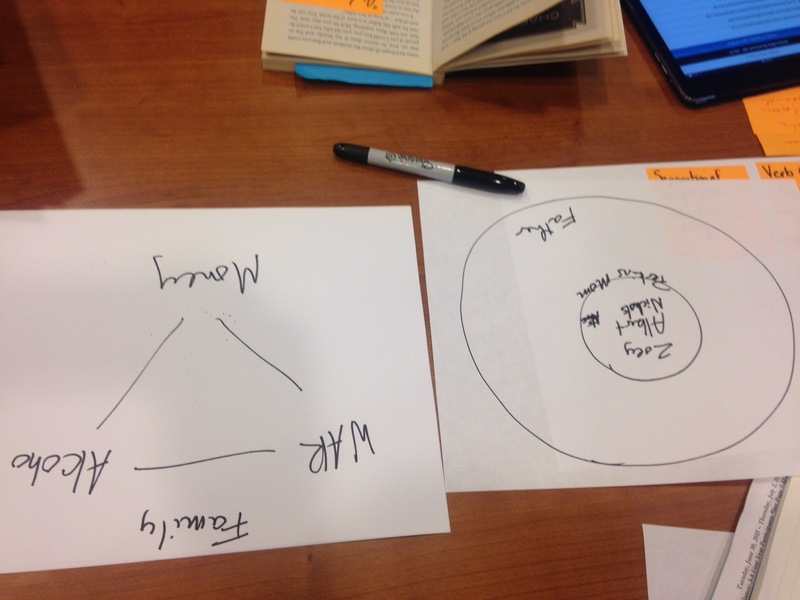 As I read, I use my background knowledge to then compare it to what I am reading. Duh! Emily suggested teaching this first explicitly with a book that is explicitly set up as a compare/contract (ex – Dogs vs Cats). Then move to more complex texts where it is more implied. Then try it across texts (ex – This text says ____ and this text says ____). FInally she had the tornado club come talk to us (the earthquake club) and we had a lively discussion about what is the same and different between our topics. She reminded us that this can’t happen until each group has gathered enough information. 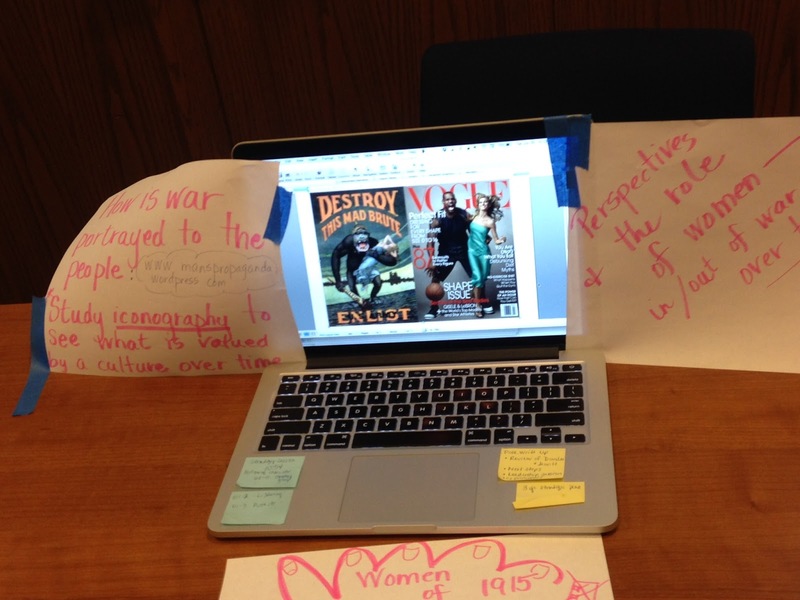 But once they have, this is a powerful way to share about the topics that groups are reading about! 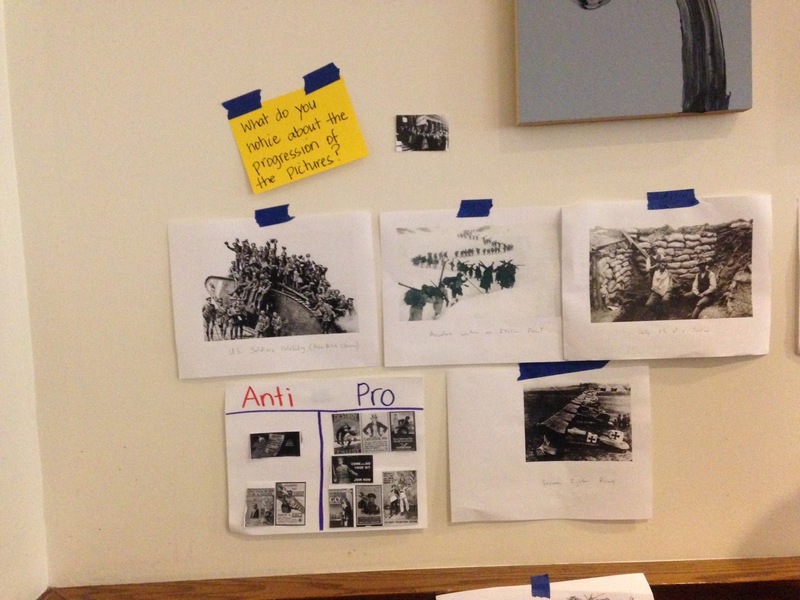 Perspective – Start with articles where explicit opinions are being shared. Then move to less explicit text. * What is the point of view of the source? * If the author were involved in a debate, which side of the topic would he be on? * What kind of language does the author use? I will be honest. I love fiction and almost NEVER freely choose to read nonfiction. 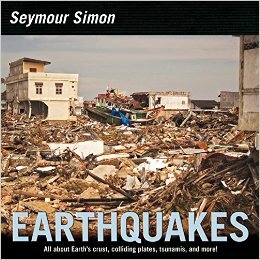 After a week in an Earthquake Book Club and trying out ways to read my nonfiction book and discuss it with my club members, I am hooked. I do like nonfiction. Thank you, Emily!! I needed this week to immerse myself in this genre and to reading about my reading of it and to discuss it in a club. Because I did it, I now feel more confident to teach it to my 3rd graders next year!! My work in Mary’s section revolved around Historical Fiction Book Clubs – I was reading the children’s novel, War Horse by Michael Morpurgo. (Others were reading the adult book Massie Dobbs by Jacqueline Winspear or the adult book The Eye in the Door by Pat Barker) The common thread was that all 3 books took place during WWI. Mary first started by sharing research as to WHY we would want to spend time in a book club. * A Carnegie Study showed how writing about reading raises the level of retention, comprehension and interpretation. 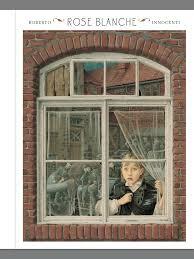 * Mel Levine’s work shows that reading or listening or watching only places info our short term memory. It is when we do something with the info (writing, sketching, acting, talking) that the info joins our long-term memory. * Pedro Niguere’s work on peer culture points out that the peer environment will always win over an academic group so we need to make it cool to be doing school. * Alfred Tetum’s work shows that reading flounders when what is being read doesn’t match the readers’ lives. Mary pointed through choice and honoring the work of a reader who “reads” a baseball game help to make this match. She also shared that when Tetum worked with TCRWP he commented that he saw “too much strategy and not enough soul”. He suggested more WHY and not only the HOW. *Nell Duke’s work shows that HS/College kids were dropping out because they had to read too much where they lacked the background knowledge to understand the reading. Research shows the importance of getting ready for a unit by coming to it with built background knowledge. Then she simply asked: What does your work group want to do? My table picked MAP. She came to us and suggested we use the document camera to project a map that we find online. And that maybe we tape together some chart paper so our map is BIG. Her coaching move here set an expectation but allowed us in the group to do the work. 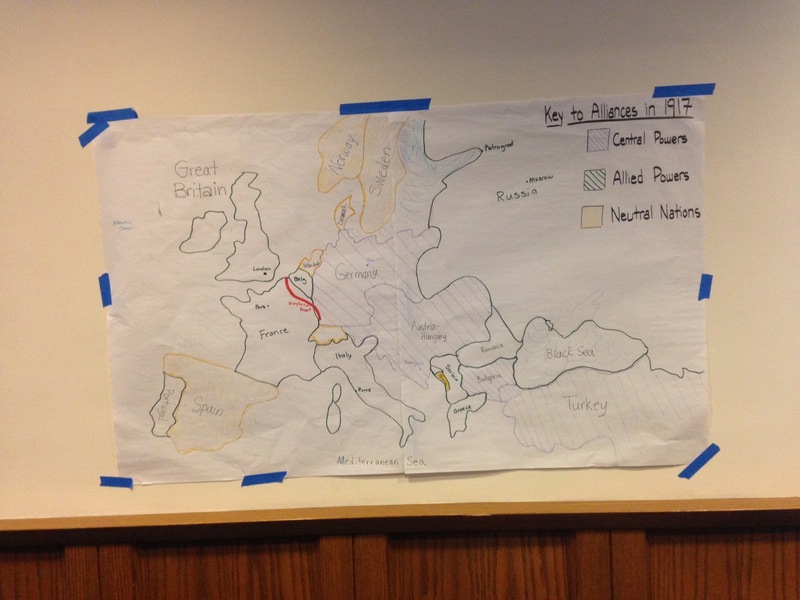 Here is our map at the end of Monday’s 30 minute work session (made by Kyle from CA, Adrienne from WA, Emily from TN and me from VA). On Tuesday, Mary shared some TIPS that she modeled on Monday to help the work groups be successful. “Years ago, I would have all the handouts prepared for you and I would have done all the work.” As teachers, always think about Efficiency vs Agency. Act more as a coach/guide instead of handing out a project to be completed. Her Tuesday tip was perspective. “Be sure to find ALL perspectives. Can you find primary sources from Germany’s POV?” After looking all together at a WWI poetry text set, listening to Jerusalem by William Blake set to music and a trench scene from the movie Gallipoli (a war where 100,000 men died in 10 minutes), we got with our work groups again thinking about PERSPECTIVE and instead of going on to make a new thing, Mary encouraged us to look at the work from yesterday and try to raise the level of that work. HOW? 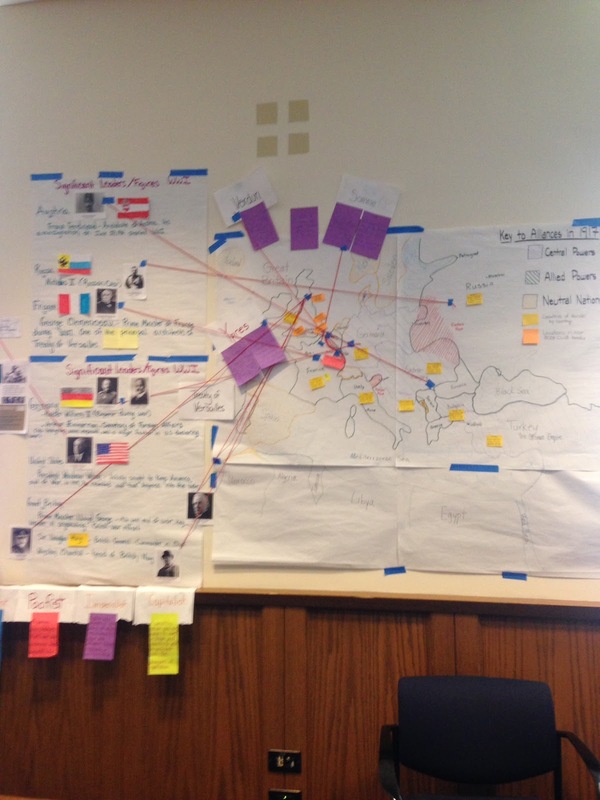 – begin to see your area (mine was the MAP) as a center that on Thursday the class will come look at to learn from. Do captions would be helpful to a visitor? – Visit others in the room and consider the connections between each part of the room. 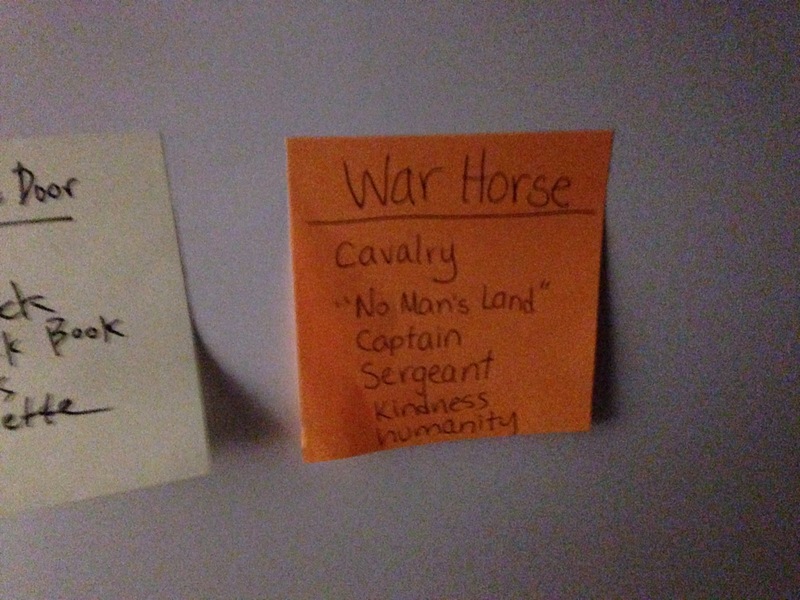 Do post-it questions need to be added to help a visitor think? And we were given 20 more minutes to work in our work groups. 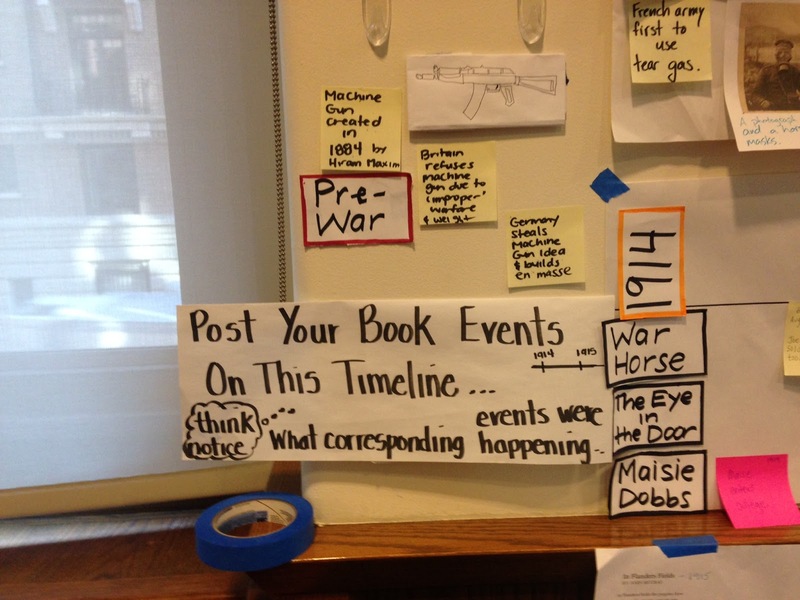 While I was learning about WWI by construction a big map for our “Classroom Reading Notebook”, others in the room created these displays for us to learn from and on Thursday, Mary gave us time to walk around the room in our BOOK CLUB group to specifically think about OUR story using the room to give us more background on this period in history. 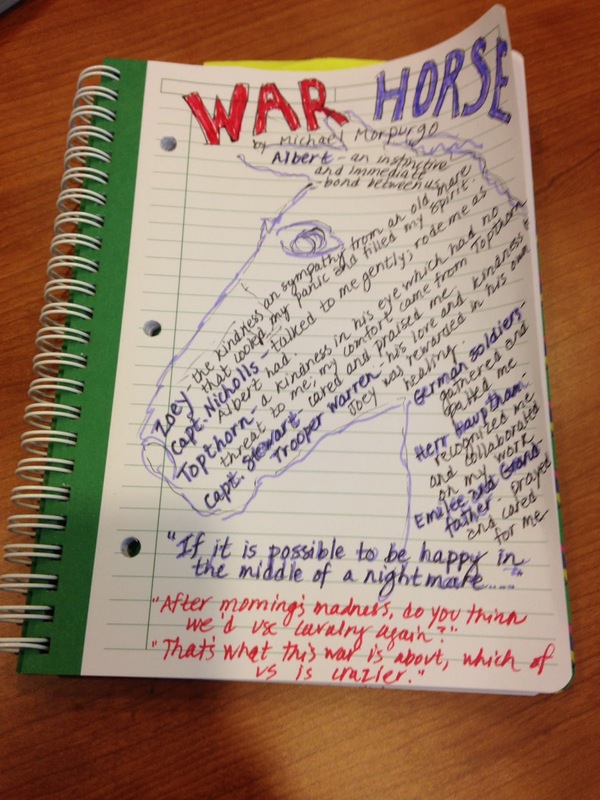 The tasks helped my group really LOOK at the words in relation to our book, War Horse. 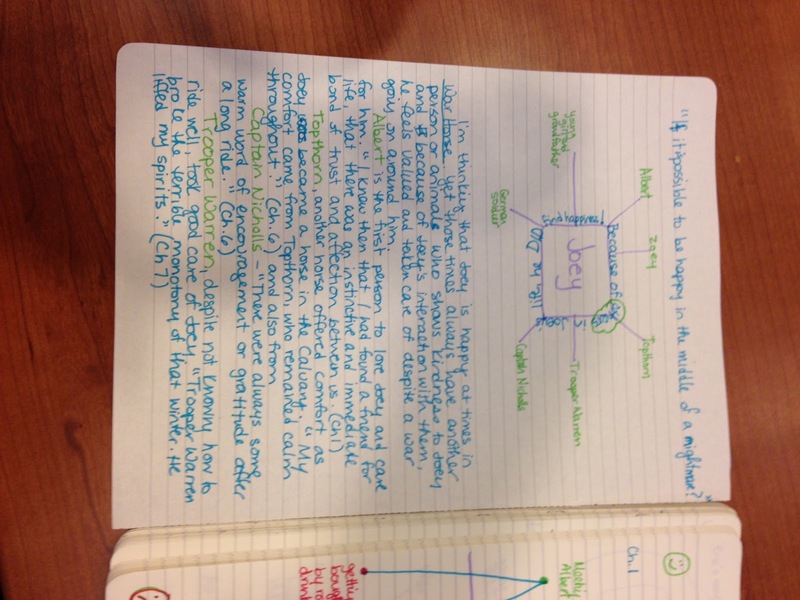 On Wednesday, Mary shared LOTS of examples from kids notebooks (can be found HERE ). Then she gave us 20 minutes in class to make one more page and she moved around the room, coaching us and reminding us to “add some color”!Here is what my group produced!! 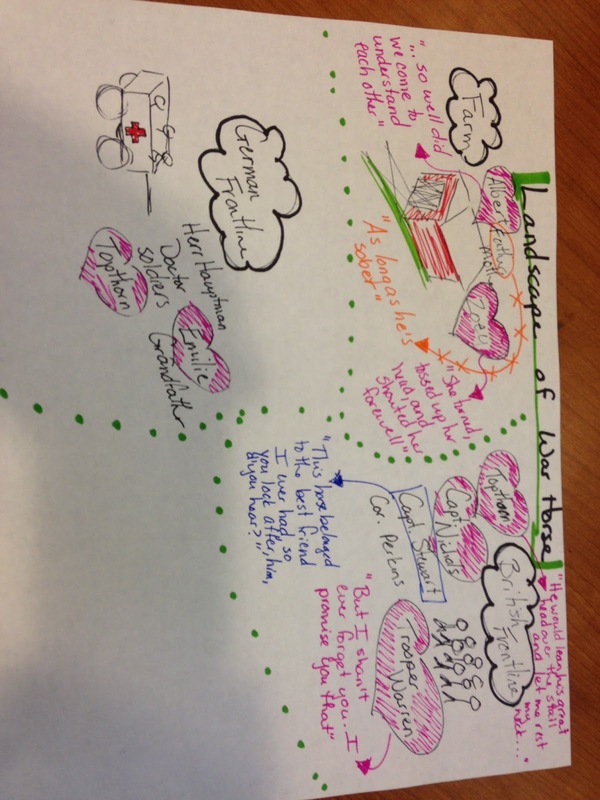 I found it fascinating to see how we sketched, jotted, organized our thinking, all so differently. Knowing that I was responsible for sharing my thinking each day with my group, pushed me to READ and then to really THINK about the story. Each day I was excited to meet as I have new ideas I was pondering and couldn’t wait to see what my smart group members were also thinking. 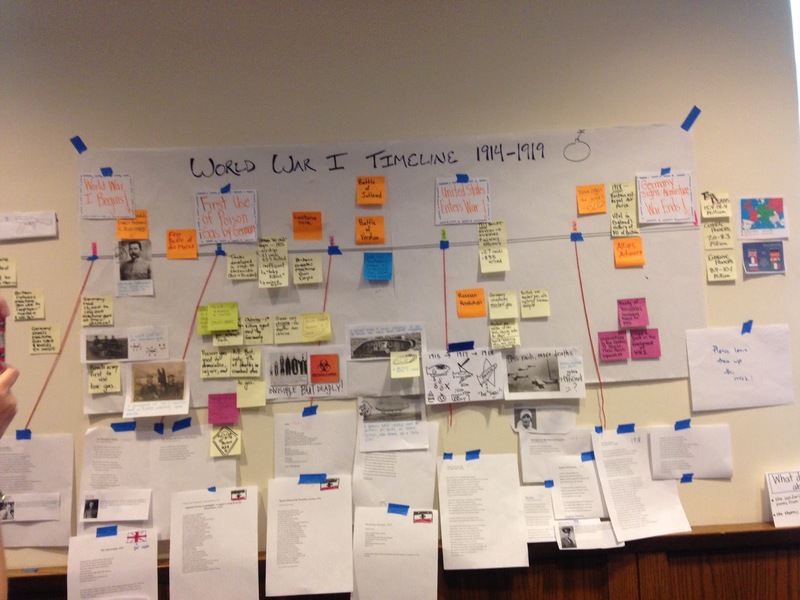 PLUS, I really got my story more, because now my “classroom” helped me to find WHERE the story was occurring and the timeline helped me to understand when and the images and word wall helped me to understand concepts. WOW – what brilliant work!! I asked Mary how young she’d do this kind of work with as I’ll be teaching 3rd grade next year. She smiled in her always encouraging way and said she saw 3rd graders in one school do a Native American book club unit! Look out, 3rd graders!!! 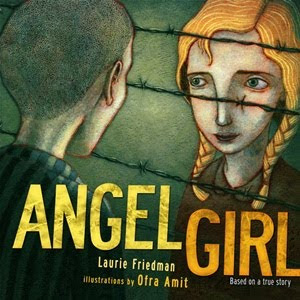 One more brilliant thing Mary did with us was a Read-aloud of two picture books set during WWII. She read the beginning of each book and asked us to notice the trouble being presented by the author. She read a little bit more of each book, one after the other, having us notice who is telling the story and how that character responds to trouble. She read more of each pushing us to think about theme. Suddenly, we, the listeners, realized that these books overlap…the girl in Rose Blanche seems to be the Angle Girl! Only Mary would find a way to weave two read-alouds together at once to have us do powerful listening and talking and thinking about characters, settings, themes and craft moves. The education world lost Grant Wiggins who died last month. He is best known for inventing backwards planning and authored Understanding by Design. First Mary reminded us to make sure we are doing work that we love, like Grant who died so young at age 64. Grant pushed us to think of the child we want to have and then build backwards from there. Grant’s latest and sadly last work dealt with the idea of transfer of skills. Grant reminded us that kids need LOTS of practice or scrimmages to try, mess up, get coaching feedback to grow their skills. My turn-and-talk partner could successfully discuss the role of the mom in the book and then transfer to a video and continue to do the work around these complicated characters. I feel so spoiled having Mary as a small group instructor and hearing her keynote!! 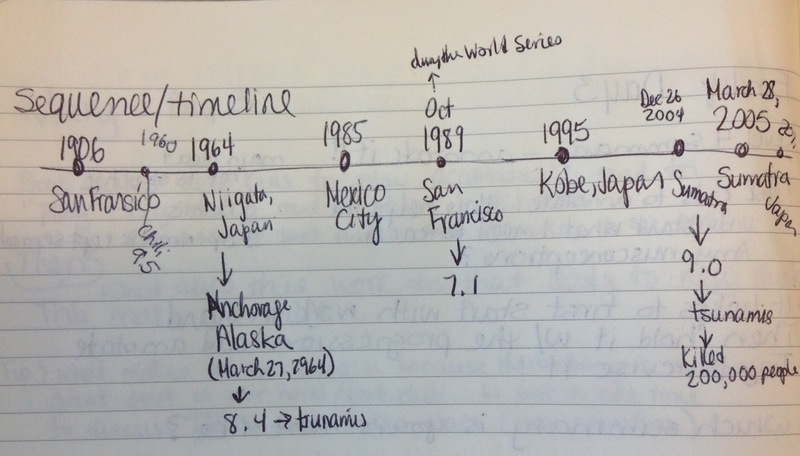 Next I will share about Emily and Nonfiction Book Club work…tomorrow! Lucy’s Keynote Address – amazing!!! Simply amazing! I realized that this was my “lucky” 13th Institute as I have been coming to Institutes at TCRWP since the summer of 2007. Lucy starts her keynote the same way, every time I’ve heard her speak…”You come from…” and names the places around the globe and the positions we hold and the situations we come from. This year she reported that we were from 40 countries and 42 states. A total of 1,300 people chosen from 8,216 applications. I felt so lucky to be sitting in Riverside church to listen and begin a week of work and inspiration. She spoke of the ideas of Brene Brown (her TEDtalk is entitled The power of vulnerability). She stated that we need to be fully engaged and willing to take risks which WILL lead us to feeling vulnerable. However, the alternative is to avoid, disengage, be fearful. She pointed out that in such a state, you are less able to be flexible and responsive. In this state, you are literally stupider! (Another good talk to watch!) She also suggested reading Brene Brown’s book: Daring Greatly: How the Courage to be Vulnerable Transforms the Way We Live, Love, Parent and Lead. To inspire, she had us watch the Collin ES Happy to Read video!! I immediately emailed my school librarian and suggested we make such a video!! It looked fun and as Lucy reminded us, our job is to rally kids to LOVE books and have FUN with books! She suggested that we must be a public learner, wearing the love of reading on our sleeve! I hope to have all my notes shared by Friday as my week of learning at TCWRP is too great to just keep to myself!